This is the season to plant sweet potatoes in Phoenix! I've had numerous inquiries about planting and harvesting this wonderful "super food". So... I knew that you'd be as excited as I was when my friend Kirsten shared this recipe on her fabulous food site, My Kitchen in the Rockies. Take a look at her collection of family recipes and enjoy your sweet potatoes in her mouth watering recipe! Golden, airy, soft, and sweet clouds of doughnuts straight from baker's heaven, that's what they are. No more messy deep frying necessary ever!! 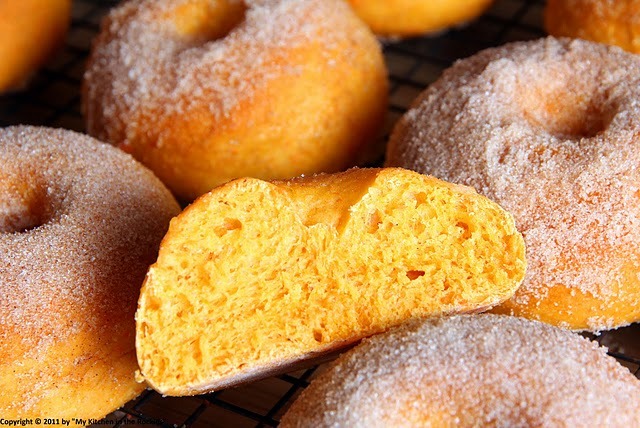 Sweet potato doughnuts are perfect straight out of the oven. They are spiced with nutmeg, rum, browned butter and a cinnamon-sugar topping. Don't miss out, cinnamon baked sweet potato doughnuts will be one of the most delicious treats you have ever eaten! This was my very first attempt in baking doughnuts (and the fourth time in my life making my own yeast dough). I didn't have a cutter for the doughnuts (like you can probably tell) and so I just used some ordinary biscuit cutters. The dough was still sticky after adding all the flour and also didn't double in size after the first rise. I told myself not to panic, kneaded in a little bit more flour, proceeded in rolling the dough and cutting out the doughnuts. The second rise made a big difference in which the doughnuts doubled in size. I was so happy. 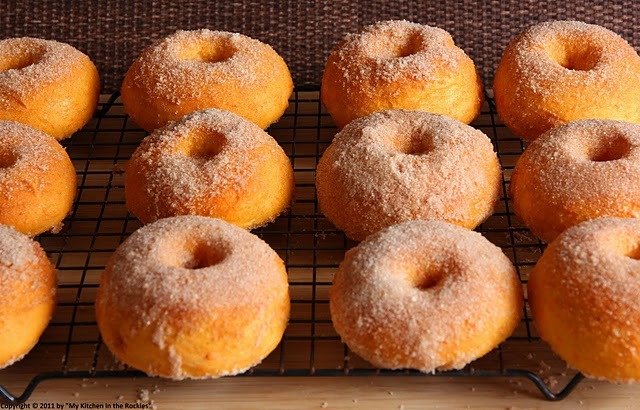 Once baked and out of the oven the doughnuts got basted with butter and rolled in the cinnamon-sugar mixture. You can see the light and airy result in the following picture. I was astonished in how easy it was to make my own doughnuts. They were also lighter , better tasting and "healthier" (is there such thing as a healthy doughnut?) than any store bought doughnut. So, don't be afraid. If I can do it, so can anybody! 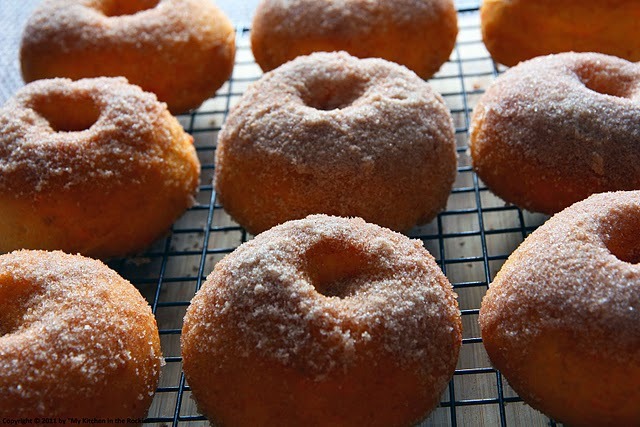 Cinnamon baked sweet potato doughnuts will be a keeper goody for special occasions in my family! Prick the skin of two sweet potatoes with a fork and cook them in the microwave until done, about 10-12 minutes. (I used the "boiled potato" setting of my microwave which cooked them automatically.) Half the potatoes and spoon out the flesh. Puree it in a small food processor until it has the consistency of ordinary mashed potatoes. Set aside 12 ounces (1 cup) of sweet potato puree. Place the butter in a small sauce pan and cook on medium heat until the butter turns brownish. Be very careful not to burn it! Set aside to cool. Heat the milk (around 105 F, 40 C) in a small sauce pan or in the microwave and add the yeast. Let it sit for about 5 minutes and until foamy. Attach your kitchen machine with the dough hook and mix together the milk/ yeast mixture, both sugars, salt, vanilla seeds, nutmeg and rum. Now add in the egg, the yolks, the browned butter and the sweet potato puree. Mix until well combined. Now it is time to add all the flour, first on slow speed to mix it all in and then on medium speed to knead the dough. Knead for about 5 to 6 minutes. If the dough is still too wet add more extra flour until the dough forms a ball. Place the dough into an oiled glass bowl, cover with a clean kitchen towel and let it rest and rise for 1 1/2 hours. I used my "rapid proofing" setting of my oven but it didn't really rise that much. So, don't worry! Place the dough on a well floured surface, punch it down, knead in more flour if still to sticky and roll it out to about 3/4 inch thickness. Cut out your doughnuts and place them on a silicon lined baking sheet. Re roll left over dough to form more doughnuts. I had two baking sheets with 19 doughnuts total. Cover doughnuts with clean kitchen towels and let them rise for a second time for about 1 more hour or longer until the doughnuts have risen light and fluffy. Preheat the oven to 400 F. Don't use Convection! Bake the doughnuts in the center of the oven for about 15 to 20 minutes. Melt the butter. Mix sugar and cinnamon. 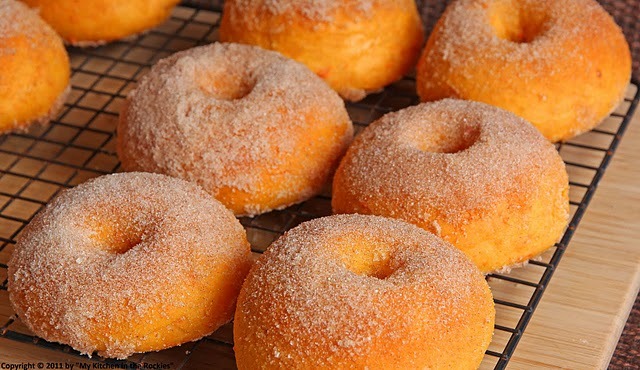 Baste hot doughnuts with butter and roll in the sugar-cinnamon mixture. Let cool on rack or serve still fresh and warm. Enjoy! Adapted from "Food &Wine" and fifteenspatulas.com. Thank you for sharing your beautiful post, Kirsten! Those donuts look so delicious! yes, this is the first thing I'm gonna make when I harvest my sweet potatoes! It'll be worth the wait! This is so wrong on so many levels. Good thing the girl scouts don't sell these - I'd be a broke man! A fat and happy broke man!